(Reuters) - Tesla Inc said on Friday it would cut thousands of jobs to rein in costs as it plans to increase production of lower-priced versions of its crucial Model 3 sedan, sending its shares down as much as 10 percent. The company, which has struggled to achieve long-term profitability and keep a tight lid on expenses, also said it expects fourth-quarter profit to be lower than the preceding quarter. Chief Executive Officer Elon Musk said the need for lower-priced versions of Model 3 will become even greater from July, when the U.S. tax credit again drops in half, adding $1,875 to the car's price tag, and again at the end of the year when it goes away entirely. The phase-out of the electric vehicle tax break confronts Tesla with the choice of raising prices at the risk of losing customers or slashing costs by thousands of dollars per vehicle, a herculean task for an automaker. Musk also faces a narrowing window in which his electric luxury vehicles enjoy a monopoly in the segment that Tesla created and defined. Over the next several years, established automakers plan to spend nearly $300 billion on electric vehicles and batteries. Legacy luxury brands such as Volkswagen's (VOWG_p.DE) Audi and Porsche, Daimler's Mercedes-Benz and BMW all plan new luxury electric vehicles. Chinese startups such as Byton and NIO are pushing ahead with technically advanced electric vehicles, building on China's aggressive support for cleaner cars. Most analysts expect China will be the world's largest electric vehicle market. Musk said on Friday the company would need to deliver at least the mid-range Model 3 version in all markets starting around May, as it needs to reach more customers who can afford the vehicles. Michelle Krebs, executive analyst at Autotrader, said she expected the year to be challenging for all automakers as new vehicle sales slow. "It will be especially challenging for Tesla as it desperately tries to rack up more quarterly profits after having one in the third quarter, and it faces an onslaught of competitors in the next couple of years," she said. The billionaire entrepreneur has been under intense pressure to stabilize production of the Model 3, a car that was unveiled in early 2016 to great fanfare and is seen critical to the company's long-term viability. But Tesla has scrambled to get the Model 3 into the hands of customers, many of whom have been waiting since early 2016, and Musk said last year that Tesla had moved from "production hell to delivery logistics hell." This is Tesla's second job cut in seven months and comes just days after it cut U.S. prices for all vehicles and fell short on quarterly deliveries of its mass-market Model 3 sedan. In a memo to employees on Friday, Musk said 2018 was the "most challenging in Tesla's history," adding the company hired 30 percent more employees last year which was more than it could support. "I want to make sure that you know all the facts and figures and understand that the road ahead is very difficult," Musk said. "There isn't any other way." Tesla sales benefited from a $7,500 federal tax credit on electric vehicles throughout 2018, but that full credit expired at the end of 2018, and new buyers will now receive only half that amount. The company reported a profit of $311.5 million, or $1.75 per share, for the third quarter ended Sept. 30, which Musk called Tesla's "first meaningful profit" since the company started. For the fourth quarter, analysts on average expect the company's net income to be $216.92 million on a reported basis. The estimate shrinks further in first quarter to $62.80 million, according to Refinitiv data. 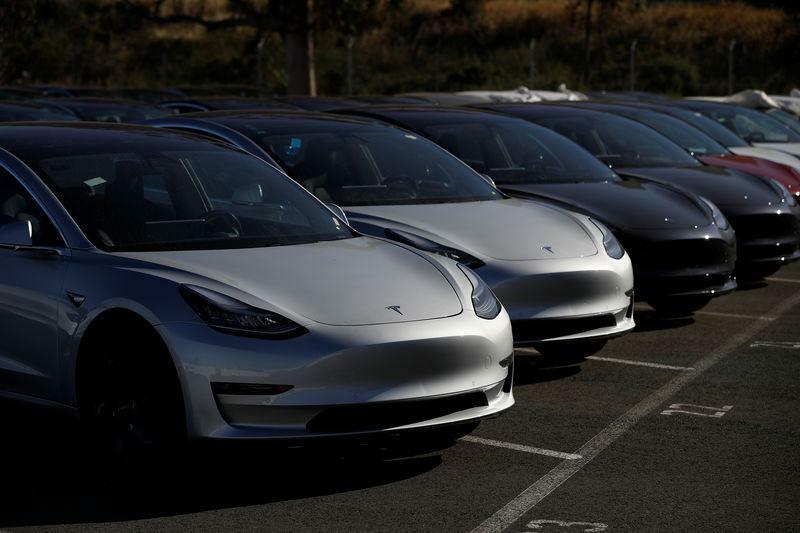 "This quarter, as with Q3, shipment of higher priced Model 3 variants (this time to Europe and Asia) will hopefully allow us, with great difficulty, effort and some luck, to target a tiny profit," Musk said. Musk, who has often set goals and deadlines that Tesla has failed to meet, surprised investors by delivering on his pledge to make the company profitable in the third quarter, for only the third time in its 15-year existence. The electric carmaker said on Friday it would reduce full-time employee headcount by about 7 percent and retain only the most critical temps and contractors.